When it comes to writing, conventions is one of the six traits that’s the easiest to fix. Conventions includes spelling, punctuation, capitalization, and grammar. With all the tools at your child’s disposal to help with these elements, there are more ways to improve conventions today than ever before. 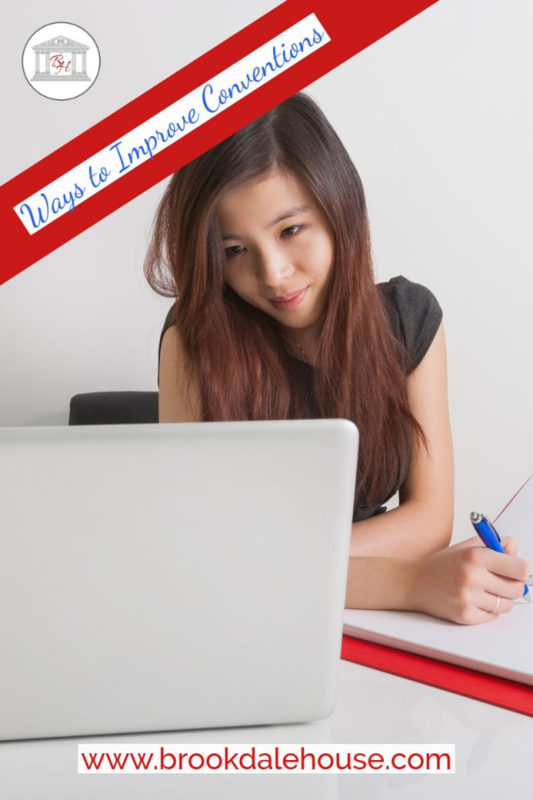 Have your child try a few of these tips in their writing. Homophones are words that sound the same but have different meanings and spellings. These are some of the biggest spelling conventions errors that won’t get picked up by spellcheck. Give your child a list of the most common homophones that may trip them up in their writing. there/they’re/theirThere means location or placement, they’re is the contraction for they are, and their is a possessive pronoun.Their friends promised they’d be there at eight, but they’re late again. it’s/itsIt’s is the contraction for it is while its is a possessive pronoun.It’s time for the dog to eat its supper. two/to/tooTwo is the number 2 which denotes quantity, to is a direction or preposition word, and too means also or in excess of.The two sisters went to the store, and mom and dad came too.Spell check! Learning spelling for uncommon or irregular words can be difficult. Memorizing all the words in the English language is impossible. Encourage your child to use dictionaries to check the spelling or questionable words, but always make sure to spell check a typed paper before publishing or printing. Most word processing programs have spelling and grammar check under “Tools”. Remind your child to check the spelling in context and to only hit ignore if they are certain the word is spelled correctly. End the sentence with a mark. Close the statements! Have your child go back through each sentence and make sure they end it with an appropriate punctuation mark: a period, exclamation point, or question mark. Use the exclamation marks sparingly. They should only be used for strong emphasis. Commas should never be used to separate independent clauses; advanced writers can use semicolons, but adding conjunctions before commas are preferred. Remind your young writer to use commas when separating words in a series or dependent and independent clauses in a complete sentence. Capitalize the first letter in each sentence. Have your child go back through their paper to make sure the first letter of each sentence is capitalized. It’s an easy mistake to make whether handwriting or typing. Remind your child of the difference between proper and common nouns. Proper nouns, which name specific people, places, or things, should be capitalized. The most common grammar error involves subject-verb agreement. Make sure your child knows that both subjects and verbs must be singular or plural. For example, Her best friends know the way to her house (plural-friends, plural-know) OR Her best friend knows the way to her house (singular-friend, singular-knows). 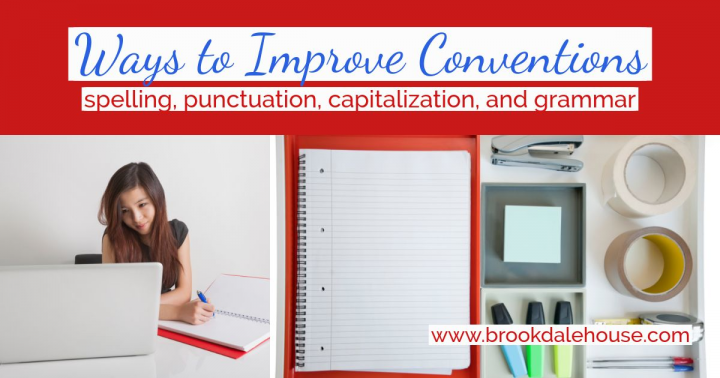 These ways to improve conventions will help your child’s writing improve with spelling, punctuation, capitalization, and grammar. Focusing on these issues that arise in writing will make your child a better writer without overwhelming them in the area of conventions. Grab your free worksheet to improve Conventions below. Grab your free worksheet here! !